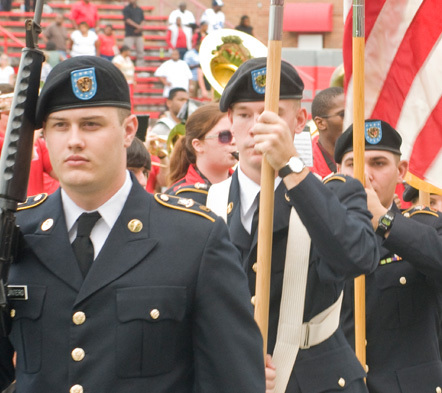 Newberry College offers a minor in Military Science Leadership. Participation in this minor is contingent upon acceptance as a contracted student in the Army ROTC program. All Military Science courses are taught at Newberry College; leadership labs are hosted at Presbyterian College in nearby Clinton, S.C.
Students minoring in Military Science Leadership must complete 15 semester hours in advanced military science. Participation in this minor is contingent upon completion of the ROTC basic courses or equivalent training and acceptance as a contracted student in the Army ROTC Advanced Course.The Newberry College Army ROTC is designed to enhance your college education by providing training and practical experience in leadership and management techniques essential to success in any career. Upon graduation from Newberry College, contracted Cadets who have successfully completed ROTC training are awarded a commission as a Second Lieutenant in the U.S. Army, U.S. Army National Guard or the U.S. Army Reserve. 18 credit hours in advanced military science and related leadership training. Participation in this minor is contingent upon completion of the ROTC basic courses and acceptance by the Professor of Military Science as a contracted cadet in the Army ROTC Advanced Course. Course substitutions must be approved by the Professor of Military Science. The Highlander cadre instructs, motivates, trains, evaluates and provides feedback to each cadet. This leadership group also ensures that students are not only prepared to be successful cadets but that they also have the tools needed to be effective leaders after graduation.